The subject of this image is NGC 6861, a galaxy discovered in 1826 by the Scottish astronomer James Dunlop. Almost two centuries later we now know that NGC 6861 is the second brightest member of a group of at least a dozen galaxies called the Telescopium Group — otherwise known as the NGC 6868 Group — in the small constellation of Telescopium (The Telescope). This NASA/ESA Hubble Space Telescope view shows some important details of NGC 6861. 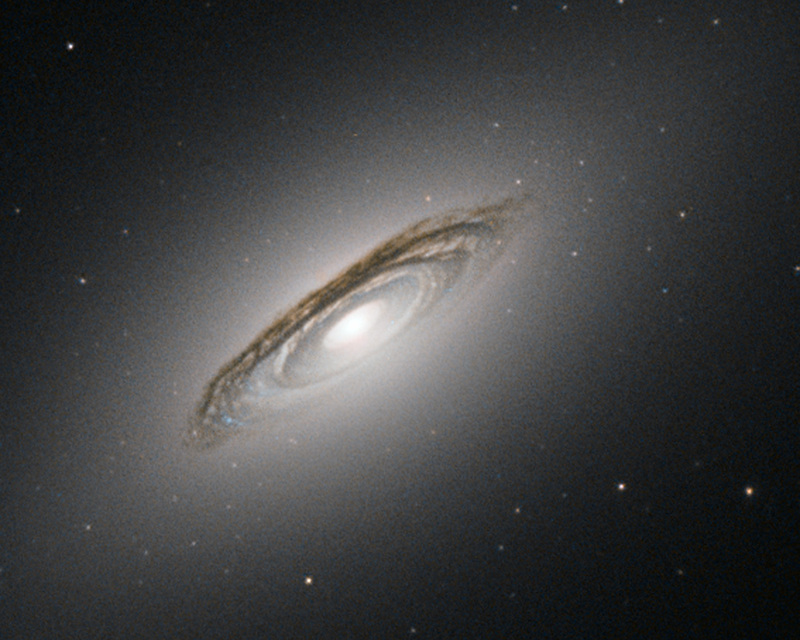 One of the most prominent features is the disc of dark bands circling the centre of the galaxy. These dust lanes are a result of large clouds of dust particles obscuring the light emitted by the stars behind them. 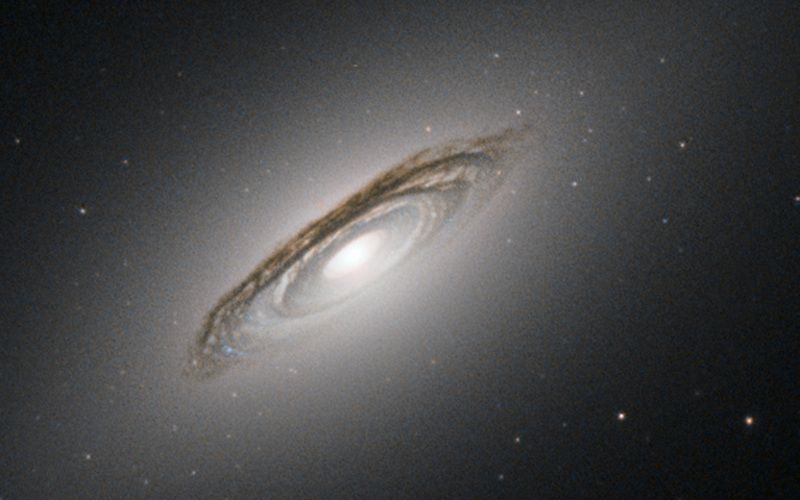 Dust lanes are very useful for working out whether we are seeing the galaxy disc edge-on, face-on or, as is the case for NGC 6861, somewhat in the middle. Dust lanes like these are typical of a spiral galaxy. The dust lanes are embedded in a white oval shape, which is made up of huge numbers of stars orbiting the centre of the galaxy. This oval is, rather puzzlingly, typical of an elliptical galaxy. So which is it — spiral or elliptical? The answer is neither! 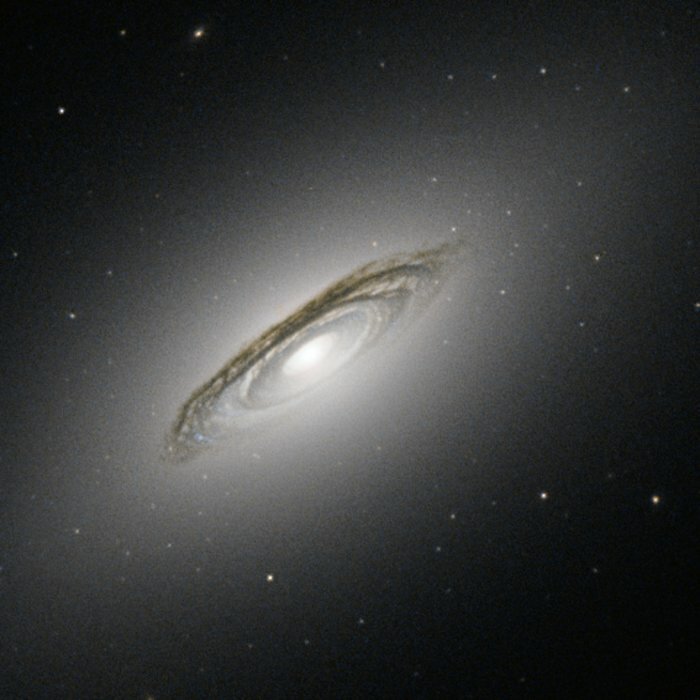 NGC 6861 does not belong to either the spiral or the elliptical family of galaxies. 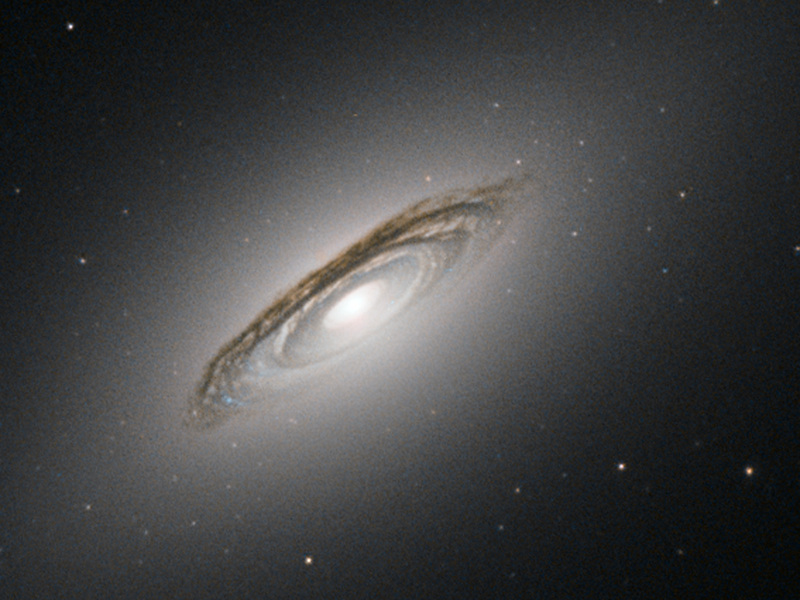 It is a lenticular galaxy, a family which has features of both spirals and ellipticals. The relationships between these three kinds of galaxies are not yet well understood. A lenticular galaxy could be a faded spiral that has run out of gas and lost its arms, or the result of two galaxies merging. Being part of a group increases the chances for galactic mergers, so this could be the case for NGC 6861. Position (Dec): -48° 22' 11.72"